US dumps Syrian proxy political front in latest move to accelerate long-stalled regime change. The Obama administration has spent the past several months in secret diplomatic negotiations aimed at building a new Syrian opposition leadership structure that it hopes can win the support of minority groups still backing President Bashar al-Assad. The strategy, to be unveiled at a Syrian opposition meeting next week in Qatar, amounts to a last-ditch effort to prevent extremists from gaining the upper hand within the opposition and to stop the Syrian crisis from boiling over into the greater Middle East. The Post also indicates that de facto “administrative zones” are being set up along the Turkish-Syrian border with “nonlethal” assistance provided by the United States, France and “other like-minded governments.” The so-called “Syrian National Council” is being discarded, as it is wholly seen as illegitimate by both Syrians and the world at large. Image: Will the West’s new “resistance front” in Syria officially include Libyan Mahdi al-Harati of the US State Department, United Nations, and the UK Home Office (page 5, .pdf)-listed terrorist organization, the Libyan Islamic Fighting Group (LIFG)? 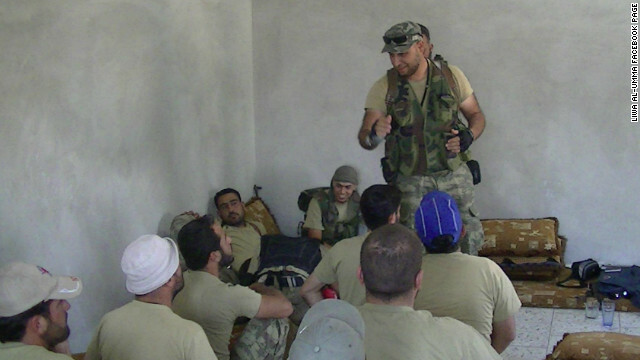 Here he is addressing fellow terrorists in Syria. Harati is now commanding a Libyan brigade operating inside of Syria attempting to destroy the Syrian government and subjugate the Syrian population. Traditionally, this is known as “foreign invasion,” not rebellion. The SNC, Clinton said, should no longer be considered the “visible leader” of the opposition. It is clear that both the West’s political proxies, and its armed militant proxies have been compromised and the narrative that tentatively worked against Libya, is now unraveling and failing against Syria. While the US attempts to portray this latest move as an attempt to “prevent extremist elements from gaining the upper hand within the opposition,” it must be remembered that as early as 2007, US officials had admitted that efforts to overthrow the governments of Syria and Iran would include primarily US, Israeli, and Saudi armed extremists drawn from across the Arab World, and sent into Syria to create the very sectarian bloodbath now unfolding. Rhetoric of “freedom” and “democracy” serve merely as cover within which foreign military aggression is couched. It was exposed in “NATO Using Al Qaeda Rat Lines to Flood Syria With Foreign Terrorists,” that indeed, the very networks used by Al Qaeda to flood Iraq with foreign fighters is now being used by the United States, NATO and the Persian Gulf States of Saudi Arabia and Qatar to violently overthrow Syria. The narrative that recent US efforts aim at heading off “extremists” from “hijacking” the armed violence in Syria, is exposed as a blatant lie. Extremists have constituted the so-called “opposition” from the very beginning, by design, with explicit US, NATO, Saudi and Qatari funding, weapons, and support.